A farmer has to cross a river in a tiny row boat. He has a goose, a fox, and a sack of grain. He can’t leave the goose alone with the fox or with the grain. He can only fit one item in the boat with him. How does he get across the river? I could never bear to tell the ending of our journey to Fort Lauderdale, but it has been over 16 months since the last leg of our trip, and it’s time to finish the story. I have it in my head that I have cursed Catmandu by leaving the last chapter unpublished. She hasn’t been herself since I stopped writing. Our friends, Dan and Jaye Lunsford, called it “The Curse of the Blog.” So, here’s the ending – or maybe another beginning. 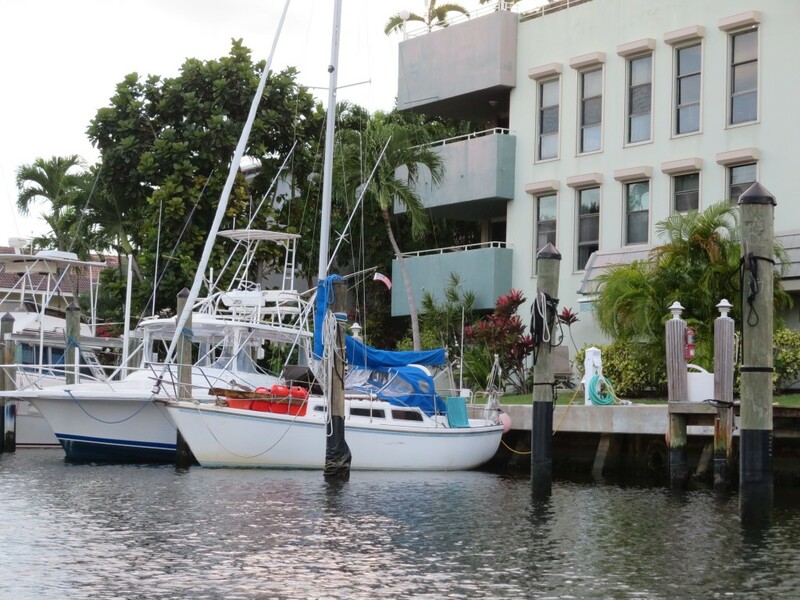 When we arrived at Vero Beach City Marina in January of 2014, we rafted up with Robin’s Nest, a 25-foot derelict sailboat that looked like it would sink at any moment and drag Catmandu to the bottom. I had to climb aboard the derelict to attach lines, being careful not to step where I might fall through. I was hoping the slimy creatures hanging from the light blue hull would not jump ship and attach to Catmandu. Poor Catmandu was probably ashamed to be rafted up or associated in any way with Robin’s Nest, and we had left her there for three weeks, until we could have a three-day weekend to get her home to Fort Lauderdale. That chance came on Valentine’s Day, a Friday night with a full moon. 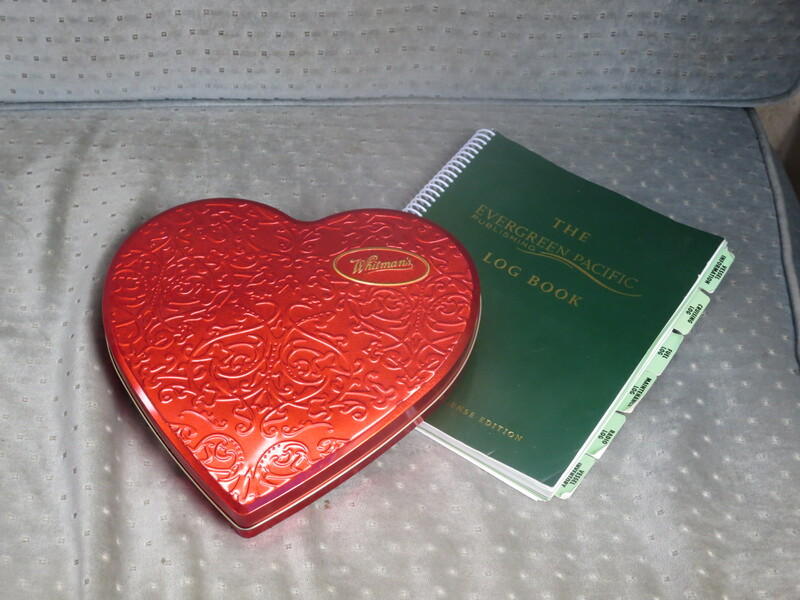 We made a pact not to exchange gifts, but together bought a red heart-shaped box of chocolates to bring with us, and a box of our favorite red wine. Boxes of wine are a boon for boaters, who don’t like to have glass aboard. Saturday we tanked up and motored out of Vero Beach. The wind was against us in the morning, but by afternoon it was a strong and steady northwest breeze. Since we were sailing south in the wide Indian River, we could put up the genoa and sail. We sailed on a broad reach for most of the afternoon with a full genoa – and at one point, we were going 7.4 knots. For Catmandu, that’s speeding. 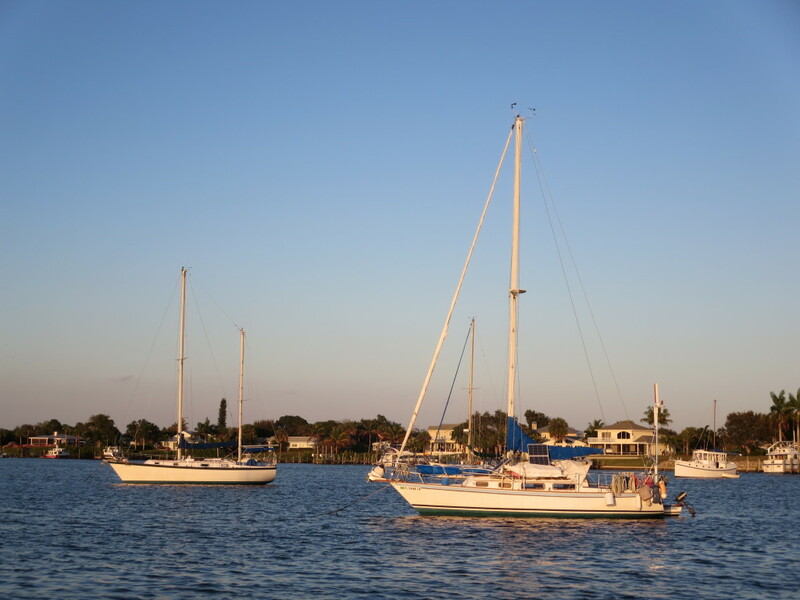 We spent the night in Manatee Pocket, a large anchorage that marks the beginning of the Okeechobee Waterway. It heads west to Florida’s largest lake. In Manatee Pocket, there were many boats anchored, but no manatees. The sunset was remarkable and the moon nearly full. I wished this were my life again: living aboard, sailing and anchoring in a different spot each afternoon, spending most of my time outside on the water. Manatee Pocket just before sunset. We started out early on Sunday. We had a long way to travel, and many bridges. For those who don’t know, bridges generally open just two times every hour, and if you’re just a minute too late, it’s a half hour wait until the next opening. We hoped to reach Loggerhead Lantana Marina, but bridges slowed us down quite a bit. 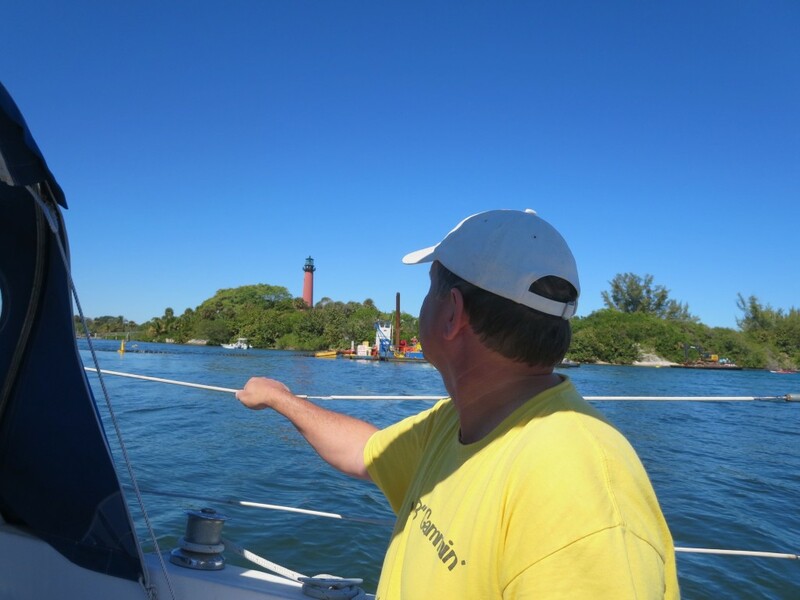 We crossed Hobe Sound and came to Jupiter Inlet where we motored past the dark red tower of Jupiter Light. Jupiter Inlet Light, and Phil. In Lake Worth we experienced the worst “waking” incident of the whole trip. The boat traffic was amazing. There were hundreds of boats, mostly power boats moving at very high speeds. Our little sailboat was bounced around from multiple directions, and the water was choppy from boats going too fast. One large boat pulled up way too close to us on our starboard side and then took off with its three large outboard motors roaring. The wake was huge and came at us like a tidal wave. Catmandu leaned over dangerously and I saw the mast swing down toward the water. It knocked me off the seat, dumped everything off the starboard shelf onto the deck below, and – worst of all – knocked over our cooler. We lost all of our ice, which is our only refrigeration on board. Yes, I remember the name of the boat. It was Timber. So, Timber, here’s a maritime lesson you should learn: You are responsible for your wake. If you had injured us or caused any damage, you would have to pay. Please, power boaters, be considerate of sailboats and watch your wake. We made it to Palm Beach that night and anchored south of the city. We were one of two sailboats in the anchorage, and after the chaos of Lake Worth, we loved the solitude. We could hear live music from a city park and enjoyed the nice sunset and the almost-full moon. Hillsboro Inlet lighthouse. We’ve climbed this one. There were some concerns, though. The engine seemed to quit at every bridge. It started again, reluctantly, but only ran well at slow speeds. 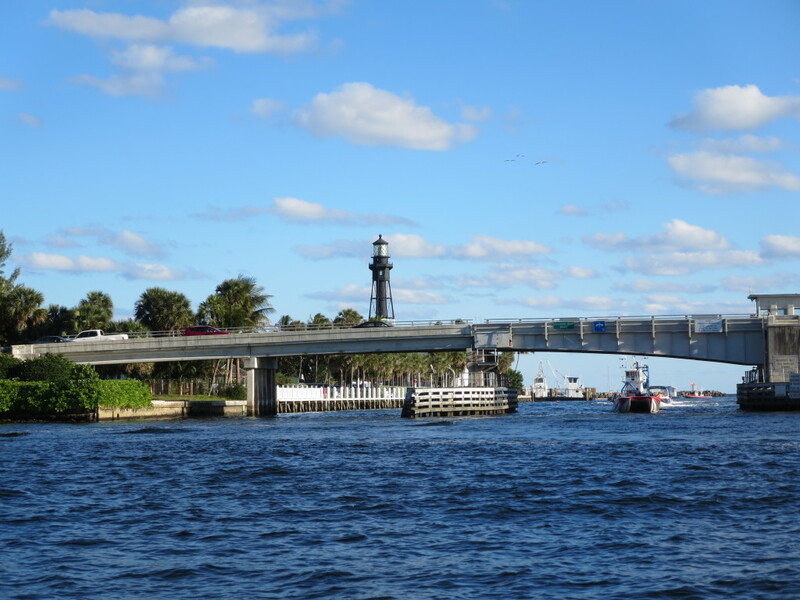 On Monday, we passed Hillsboro Inlet and were faced with four more bridges before we got to our slip in Fort Lauderdale. In Lake Boca, the engine failed completely. While I lounged on the deck and watched the party going on all around us (poor me), Phil was below, working on the engine. He installed a new electronic ignition, but it didn’t solve the problem and 20 minutes later, it quit again. Phil got it started, and the boat limped along at low speed into the afternoon. Phil saw two manatees at Oakland Park Bridge in the fading light. We were almost home, but had to stop for another bridge. While I was spying my own manatees off the bow, Phil saw two real manatees and pointed them out. I wasn’t quick enough to see them and mine turned out to be coconuts. The engine was barely going, fading and rallying half-heartedly as we limped along through the highly populated canal. Just a mile or so past the bridge, the engine quit and would not start again. We raised the mainsail and I tried to sail a little while Phil worked on the engine, but the wind was nearly still and the sail useless. We dropped the anchor. We had motored and sailed the 31-year-old boat for nearly 1220 miles from Annapolis, and three miles from our final destination, she refused to go on. She was on her last legs. I can’t say enough about the towboat drivers for TowBoatUS. From the pair of ill-fated North Carolina rescuers who towed us from their own broken boat through the Alligator-Pungo Canal in the dark, to the skilled solo captain who came to rescue us in Fort Lauderdale, these guys are good. They go the extra mile, so to speak, and I have seen them skillfully bump the sailboat gently into a slip, stern first, and never endanger a piling. It’s remarkable. Shortly after we anchored in the waterway, a police boat came by just to be sure we weren’t staying there. The towboat came five minutes later, helped us raise the anchor and put on the tow bridle. He opened the Sunrise Bridge for us, and we were on our way. However, we had never been to the slip by water, and only by land during the day. It was full dark by then, and we didn’t know where we were going. With the tow boat driver’s local knowledge, and Phil’s GPS coordinates, we made our way to the right canal (among many canals) and overshot our slip by a few hundred yards. “Oh, no problem,” the tow captain said, “I’ll just do a 360 here and get you back.” In the narrow canal, with mega boats on either side, he managed to make a U-turn with us in tow, return to the right slip, and nudge us into place. We could only help by attaching our lines to the pilings and pulling Catmandu, stern-first, up to the dock. We were home. Catmandu in her new slip on Isle of Venice in Fort Lauderdale. Except that we had left a car in Vero Beach. “Not tonight,” Phil said. “We’ll get it in the morning.” We got into the rental car and went to our apartment. Finally, our home and our boat were in the same city. With the engine out of order, our travels were over for the time being. Don’t think Catmandu became an abandoned derelict like Robin’s Nest. Every weekend, Phil tried one repair after another, getting closer each time to solving the mystery of why the engine quit and wouldn’t start again. Personally, I think she was just tired and needed to rest. She gave all she could and nearly got us there but couldn’t go one more mile. Exhausted after 1200 miles, she deserved a quiet respite and she got it. Meanwhile, Phil is planning weekends on the water, looking at charts of Miami and south, dreaming of a week in the Keys. We are bound to venture out soon, and so this isn’t the last blog post. I’ll never forget the trip south on the ICW, when we had to arrive somewhere down the line every day. But now, we have nowhere special to be and can truly explore the warm waterways and anchorages that surround us. Maybe we will see dolphins and even manatees. Surely we will see spectacular sunsets fringed by palm trees; we will feel warm ocean breezes and enjoy the tropical beauty of our new home. Catmandu will sail again. June 14, 2015: Catmandu is still having trouble. We’ve been out for weekends but can’t stray far from home because the engine is unreliable. Last May, we planned a long weekend in Biscayne Bay, but around the first bridge, the engine started sputtering and we turned around. Recently, we planned to visit Lettuce Lake a few miles north and had to sail the last half mile. The engine quit and wouldn’t start again. Finally, many repairs and new parts later, we thought it was fixed and took the boat to Loggerhead Marina a few miles south of here. We were ecstatic! The boat is fixed! But coming back, just before the 17th Street Bridge, the engine quit again. We put up the sail and barely made it under the bridge. We had to drop the anchor. TowBoat came to get us. Is it the heat? Is the boat just afraid of bridges? Or is it the Curse of the Blog? Now, we will find out.